Full recordings of theater productions are a bit of a rare thing these days. And I can't blame them - there' potentially more money to be made my keeping the content exclusive to theater-goers instead of trying to tap the home video market. Thus it seems we're limited to the longer-running shows with anniversary releases or some rather older ones that just happened to have a recording made for one reason or another. So I was pretty surprised when news of a home video version of Shrek the Musical had been released initially via Netflix and later on DVD and Blu-Ray. And we're all the better for it since it's definitely one of those musicals that I admit I wouldn't be too keen on seeing right off the bat since it's clearly more oriented towards children. But the production value of this show was surprisingly impressive, and I can finally understand why it managed to become a contender for several Tony Awards after it debuted on Broadway. And we're certainly lucky that it finally got released on home video. 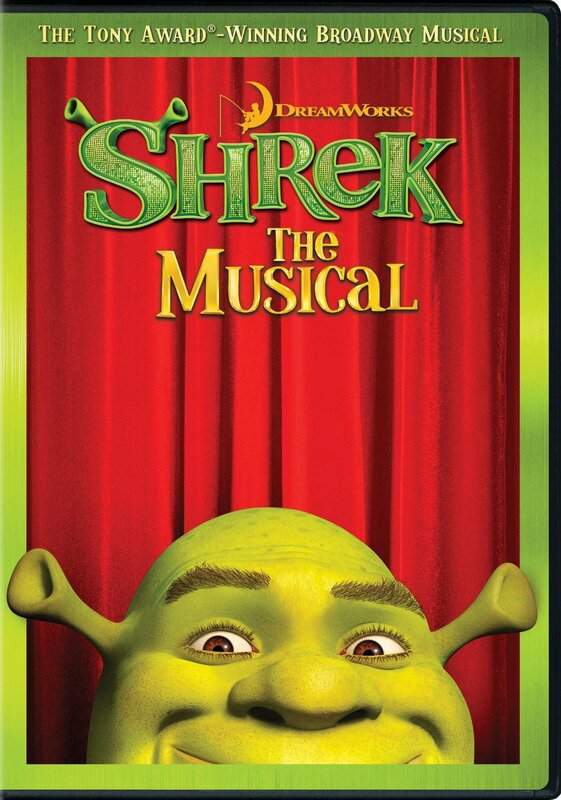 Synopsis:Shrek The Musical is a 2008 Broadway musical based on the 2001 DreamWorks animated movie Shrek. Music was by Jeanine Tesori and book and lyrics by David Lindsay-Abaire. The story begins with Shrek as a young ogre being sent out to live on his own by his parents. Given the instinctive fear and revulsion that greets ogres, Shrek (Brian d'Arcy James) grows up to terribly bitter and anti-social as he lives all alone in "his" swamp. But things change when Lord Farquaad (Christopher Sieber) of Duloc banishes all fairy tale creatures to Shrek's swamp. Shrek then tries to confront Lord Farquaad about the new residents in his swamp and ends up being saddled with the task of rescuing Princess Fiona (Sutton Foster) from a dragon in exchange for the return of his swamp. Shrek is also accompanied on this journey by Donkey (Daniel Breaker), a magical talking donkey. Donkey somehow manages to force himself into becoming Shrek's friend and the two quest to secure Fiona from the dragon. As for Fiona, it is revealed that she was placed in the tower for the precise purpose of being rescued by a suitable prince, but instead she gets an ogre and a donkey. Like most recordings of stage plays, I'll always have mixed feelings about the camera work involved. The purist in me just wants a full shot of the stage without close-ups, thus giving the audience the option to focus on any part of the stage that they want, like in the actual theater. But of course the demands of the home video market demand elaborate shots and a closer look at things. Thus the director of the recording is the one who dictates where our attention should go - at times it feels like we might be missing out on something outside the camera's scope. That aside though, the musical in itself was rather impressive, especially from a production standpoint. The costumes were all great translations of the various characters into live-action. But those same costumes still allowed for a great amount of flexibility in terms of acting and performing, which are always essential to any show of this nature. Special mention has to go to Christopher Sieber as Lord Farquaad, especially since most of his time on-stage was spent on his knees in order to remain consistent with Farquaad's rather short stature. And he doesn't just walk across the stage every now and then. He actually runs (or shuffles? ), jumps and is pretty much very physically active. And to do all that while still giving a 100% singing and acting performance is pretty stellar indeed. The music overall was pretty good, although not quite breakout in terms of overall impact. At least it didn't come across as feeling hokey and too "old school musical" in tone, which is the sort of sing-song that we see in a lot of theater productions adapted from movies. The end result is a whimsical, fun little adventure in entertainment that has fun for viewers of all ages. Shrek The Musical isn't the best show out there, but it's highly enjoyable and quite technically impressive on a number of levels. And we're all made better for the fact that it was released on home video and perhaps more shows may go this route. Thus the production gets 4 subtle references to other Broadway plays out of a possible 5.